DC Office Udalguri Recruitment for Data Entry Operator: Last date 10-07-2017. - Jobs4NE : Jobs in Assam and North East India. 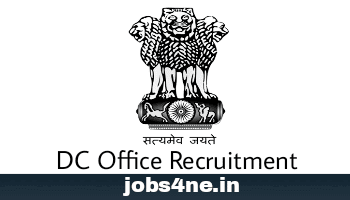 DC Office Udalguri Recruitment for Data Entry Operator: Last date 10-07-2017. Applications are invited in Standard Form as published in Assam Gazette in Part-IX from the citzen of India as defined in Articles 5 to 8 of the Constitution of India for filling up of the following posts sanctioned by Govt. vide letter Nos.ELE. 321/2014/20 Dated 20.03.2015 in the office of the Deputy Commissioner, Election Branch, Udalguri. Last date for submission of application: 10-07-2017. Name of the post: Data Entry Operator. No. Of post: 02 Nos. (UR). Age limit: Not lower than 18 years and exceeding 38 years as on 01.01.2017. Relaxation of age is admissible as per existing Rules. Scale of pay: Pay Band-II; Rs. 5200-20200/- + G.P. Rs. 2400/- p.m. Desirable Conditions: Candidate must have typing speed of not less than 8000 key depressions per hour. A certificate of typing / Skill Test is needed. How to Apply: Mandatory particulars to be enclosed with the application are HSLC Admit Card, Pass Certificate & Mark Sheets of HSLC and Graduation, PRC, Caste Certificate, Employment Exchange Registration Card, 4 (four) copies of recent passport size photograph on front side with name of applicant and address of the applicant written on the rear side and 1 (one) of which will have to be pasted on appropriate opposition of the application. An envelope affixing postal stamp of Rs. 10.00 and also writing of applicant’s full address shall be submitted. Candidates may also mention mobile no and E-mail ID in their application. The applications should be sent to the following address through Post or by hand super scribing the post applied for on top of the envelope. The address of recipient is office of the Deputy Commissioner, Udalguri District, PO. Udalguri, Pin-784509, Assam.